The first President of Indonesia was indeed popular. The name is Soekarno. In Bangka Island, you can find a historical site related to that person. It is the Menumbing Hill. There is a historical house in that area. Both Soekarno and Hatta were exiled in it back then. To be exact, the location is in Mentok District. It is in the northwest of Bangka Island. The locals consider it as the main attraction in Menumbing hill, so they keep coming to witness the trace of exile. In terms of appearance, Menumbing hill is similar to others. Though, it is the home of a famous building. The name is Soekarno Hatta’s exile site. It is similar to a villa. In the yard, you can see some big palm trees and numerous small plants. Some cars are parked near to it. The yard feature stairs, too. The house is situated on the highland. That means you can also witness stunning views from the top of the house. On the roof, there are several country flags of Indonesia. Most of the visitors are historians and adventurers. Though, regular tourists also often come there. Both the hill and the house become main attractions in Mentok District. The house applies colonialism architecture and it emits a gorgeous aura. The best thing is you can enter it freely. Once you enter the house, you can explore all parts of it. These include a bedroom and a meeting room. There is also a Soekarno’s working desk. On the walls, you may witness several photographs. They are arranged neatly. All the furnishings are original. These radiate historical values and beauties. Not to mention they remain in the same spots. The management didn’t do any alterations to them. There is also the best attraction of the house, which is Bung Hatta’s car. The name is BN 10. It represents the colonialism era. The color of the car is black and its condition is good. Tourists are allowed to take pictures of the car, actually. It will be the best object to capture! In the lower part of the house, you can find a small garden with its benches. It is the best place to relax. You are allowed to sit and enjoy the nuance of Menumbing Hill. In some occasions, a group of people comes to this house. They conduct a small research regarding its history. 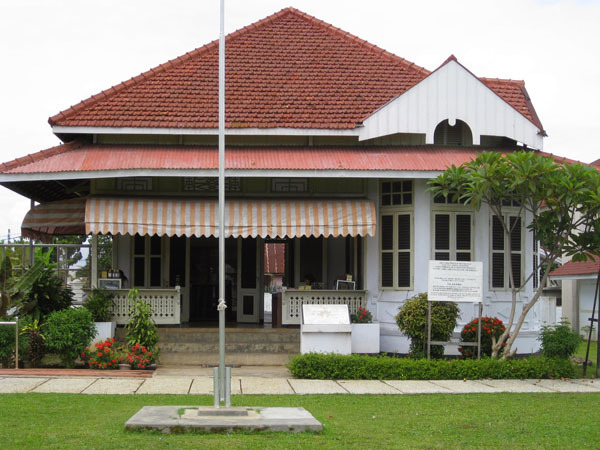 Overall, Menumbing Hill becomes more popular due to Soekarno’s Exile House. If you are visiting Mentok, you must come to this location. From Tanjung Pandan, you must head to Pangkal Pinang City. That means you need to cross the sea. Once you reach Pangkal Pinang, you can directly head to Muntok. The trip takes 2 hours and 30 minutes. The distance is about 135 km. From here, you only need to reach Menumbing Hill. The house is situated near to it. Since it is located on a highland, you need a comfortable vehicle.